Guillermo del Toro has always been one of the live-action directors who's sensibilities lend themselves easily to animation. From Pan's Labyrinth to Hellboy, his films have often employed visually astonishing effects and created fantastic worlds onscreen. Not only that, but Pacific Rim was essentially an anime come to life. It's unsurprising then, that his name keeps cropping up in the credits of animated flicks, with him having had creative impact in several recent Dreamworks productions, such as Puss in Boots and Kung Fu Panda 2. Now he's producing an animated movie for another studio- this time 20th Century Fox. 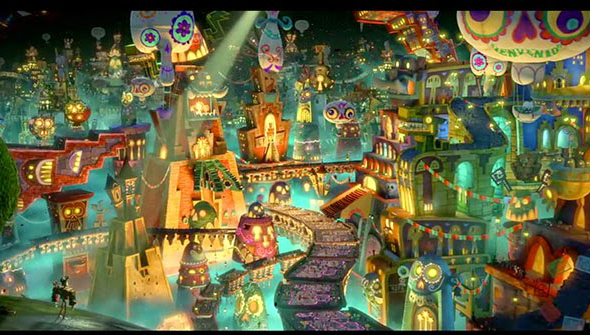 The Book of Life is a Mexican flavoured tale, that we have to admit was not on our radar until now. Aside from star names Channing Tatum and Zoe Saldana, the cast is mainly made up of Latino actors, including Danny Trejo (of course) and Cheech Marin . It takes its inspiration from Mexican tradition Day of The Dead, and will beat Pixar's similarly-themed film into cinemas by a good couple of years. This will be the first feature helmed by Jorge Gutierrez, who was best known for the animated TV series El Tigre. The CG animation has an appealing visual style, and has a certain stop-motion feel to it. Although the trailer at first suggests a solid but unremarkable family film, once main character Manalo enters "The Land Of the Remembered" it really begins to take off. It looks like fans of The Nightmare Before Christmas and The Corpse Bride are going to love this one. The Book Of Life will be released in the States on 17th of November 2014 with the United Kingdom following on the 24th.